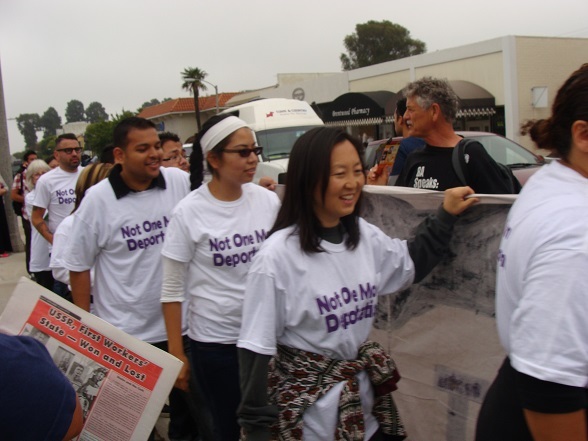 SANTA MONICA - Hundreds gathered and 11 were arrested--many of them risking deportation--in an act of civil disobedience calling on President Obama to usher in the planned legalization of millions of undocumented immigrants by halting all deportations. 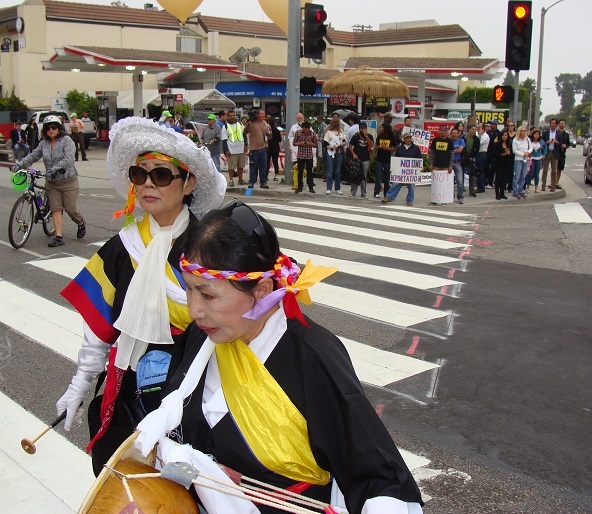 Protesters gathered to decry other issues as well, including the imposition of the Keystone XL oil pipeline. The day's events were marred, however, by a shooting spree that occurred just blocks from the protests that took the lives of five and injured several more. 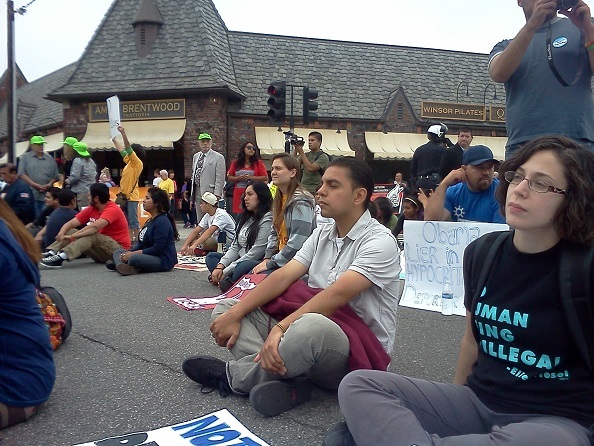 In nearly every city Obama has appeared over the past few weeks, he has been met by immigration activists who have used civil disobedience to make their message heard. It happened last week in Chicago. (Also, a similar action targetted Wisconsin's racist senator Ron Johnson the next day in Milwaukee.) So Los Angeles, a key battleground in the struggle for the rights of the undocumented, a presidential cameo at a Democratic Party fundraiser at a private mansion could not be ignored. 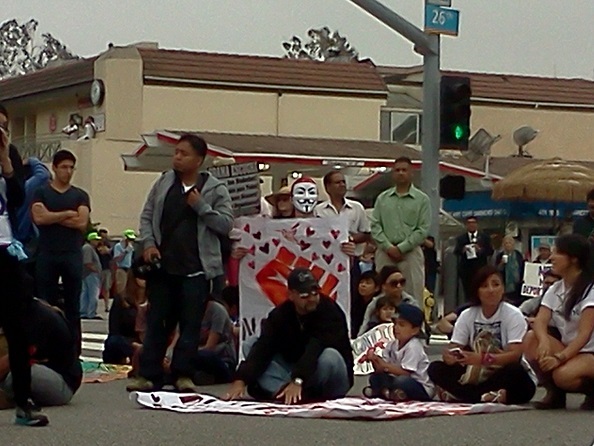 Hundreds of activists--most of them youth--gathered at the corner of 26th and San Vicente. Soon , just where Santa Monica borders on Brentwood. 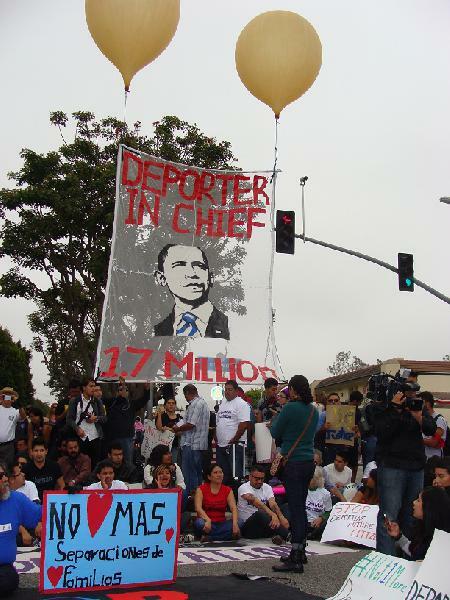 We took the intersection, holding it for over two hours and suspending an enormous banner bearing Obama's portrait and the label "Deporter in Chief" from a pair of giant balloons. The timing of the action was propitious: Friday was the first day that S.744, the immigration reform bill, was heard in the full senate. Likewise, the House had just voted Thursday to end the shielding from deportation of youthful migrants by Obama's deferred action program--a direct slap in the face to the youth movement. A large black banner reading "Stop Deportations" spanned the center of the intersection, and the designated arrestees sat in a line just behind the banner. Protesters circled defensively around the banner and those seated, and were themselves surrounded by a security task force of youth wearing purple armbands. 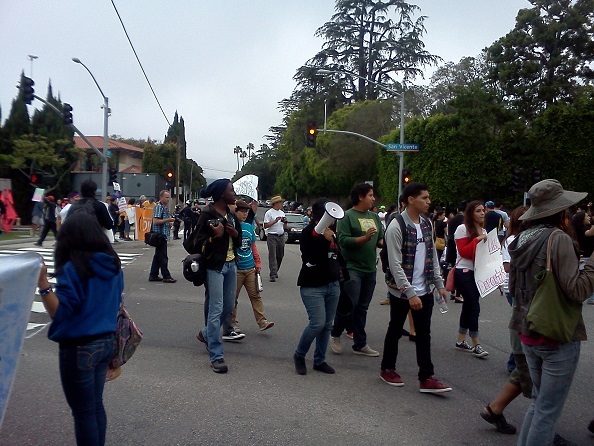 The chants were the hallmarks of the undocumented youth movement: "Education not deportation" and "Queer! Queer and unashamed! 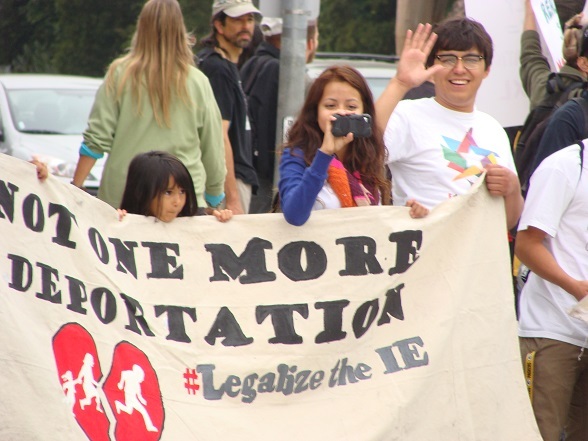 Undocumented and unafraid," with the notable addition of the novelty "Another deportation! (Not one more!) Family separation! (Not one more!)" Eventually we took seats around the black banner, expanding the seating area until taking up the entire intersection and blocking traffic completely. 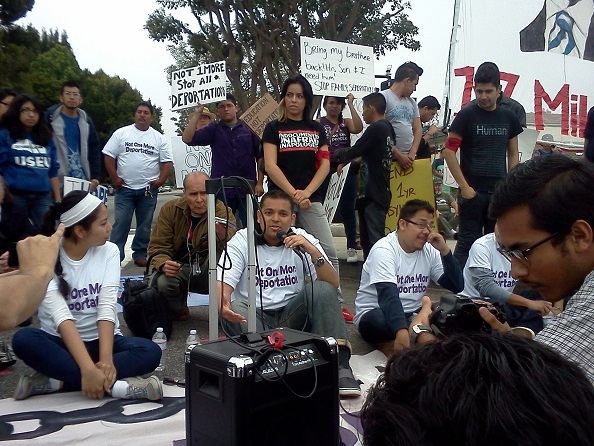 Once the crowd was riled up, we heard from several immigrants who have faced deportation proceedings. Subsequently, each of the designated arrestees each got a chance to speak. They included undocumented youth and such prominent allies as the directors of major immigrant rights organizations and people of faith. At various points during the sit-in, authority vehicles attempted to break our unity by penetrating our lines. The first was a red sports car with red lights in its grill and labeled "Fire" on its side. Authorities murmured something about it's needing to get through due to a "medical emergency." Thinking it might be some of our people needing help, we let it through, but it continued through the intersection and out the other side. The second time, a black Crown Victoria came aggressively into the intersection, reluctant to even slow down in its approach. As it passed, I observed the passenger holding a large rifle-type weapon. Both he and the driver of the vehicle wore combat-style uniforms. The vehicle was unmarked. Eventually, police issued a dispersal order through a faulty PA system. While the message was not clear, the unmistakable phrase "shooting and killing" caught my ear. 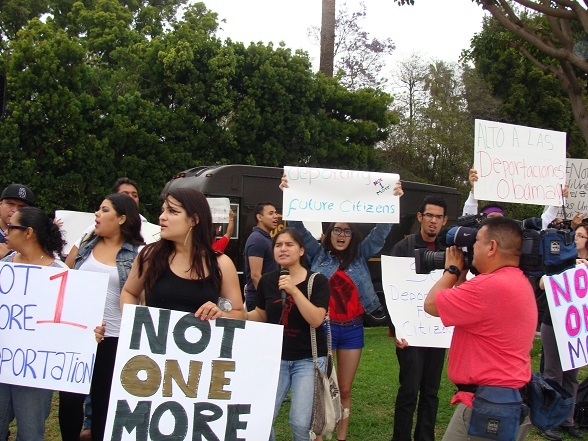 Soon word spread through the crowd that there had been yet another mass shooting at nearby Santa Monica College. We were taken aback, but refused to be deterred. 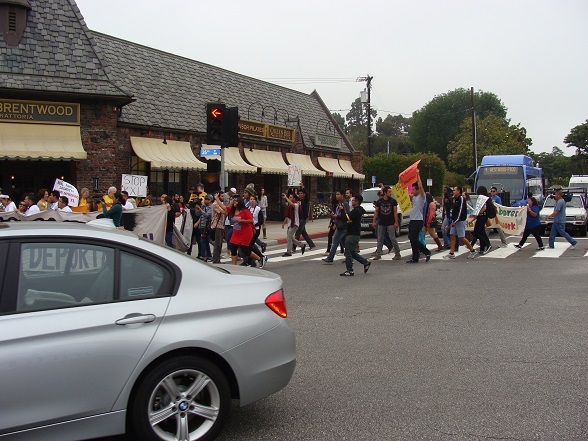 We held the intersection for another spell until we eventually cleared out to allow the police to do their thing. They donned riot gear and encircled the seated dozen. One by one, the white-clad disobedient were placed in plastic hand cuffs and escorted above an ancient-looking dark blue police bus. It took them about an hour to go through all the arrests. The energy was high throughout the event, and the overcast weather helped prevent us from getting too hot. We followed with a debrief and a testimony from a Fresno man who NDLON and supporters were able to remove from detention. Now removed to the sidewalk, we held a moment of silence for those who perished in the tragedy. Many of the LA-based supporters rushed to the jail to await the release of the arrestees, all of whom were released fairly quickly. The Obama administration has so far deported approximately 1.7 immigrants, many of them through the controversial "polimigra" programs 287g and Secure Communities, known in the movement as SCOMM. The deportation rates are the highest ever in history. "Bring my brother back! His son and I need him! Stop Family Separation"
Not One More Deportation. Legalize IE. This is when traffic was still getting through. The designated arrestees make their way to the intersection. Sitting and listening to the testimonies. Adrian James of the IE-IYC speaks out. 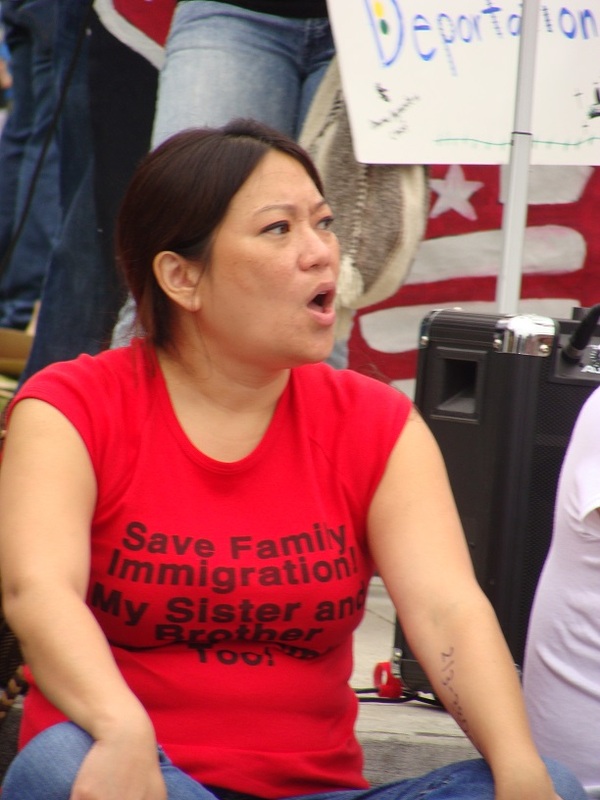 The shirt reads "Save family immigration! My sister and brother [...] too!" 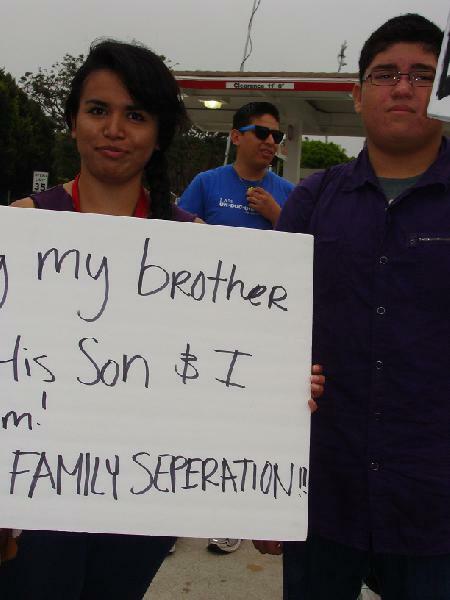 The shirt refers to the proposed change in immigration law that would eliminate family petitions for adult siblings.